Forget under-salted, these days pasta is under assault! But it still makes a delicious healthy dinner one night a week. For weeknight cooking, I prefer a quick pasta to a low-and-slow ragu. Good technique can turn a handful of ordinary ingredients into a delicious family meal with just a little effort. 1. Cook the spaghetti according to the packet directions. 2. Heat the oil in a frying pan over medium heat and add the garlic and eschallot and cook for a minute, until fragrant. 3. Add the prawns, season with salt and fry for about 3 minutes until cooked through. Add the thyme, vermouth (if using) and a teaspoon of lemon juice and remove from the heat. 4. When the pasta is ready, drain it and reserve ¼ cup of the pasta water. 5. 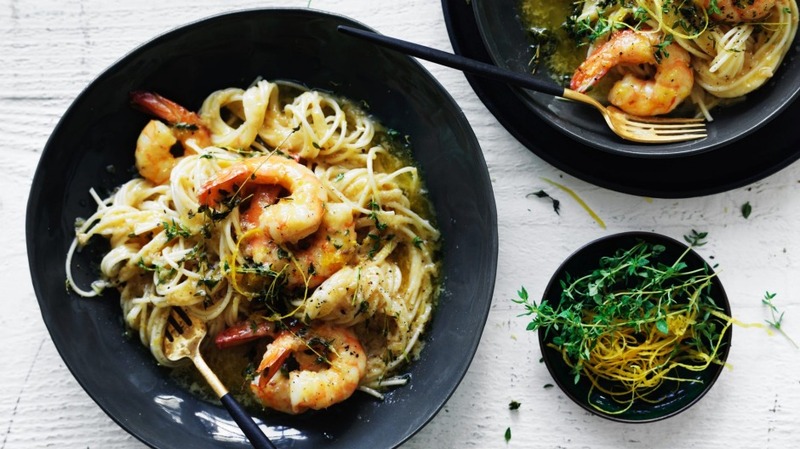 Return the pasta to the pot over a low heat and add the prawns (and any pan oil and juices), the butter, lemon rind, lots of freshly ground black pepper, and the reserved pasta water. 6. Stir briskly with a wooden spoon until the butter has melted and emulsified with the pasta water and coats the pasta. Transfer to plates and serve immediately with roasted broccoli. Adam's tip Don't think of a pasta meal as pasta plus sauce. The ingredients you team with pasta are there to flavour the pasta itself. Quickly cook these ingredients in oil to flavour the oil, then emulsify that oil with the pasta water to coat the pasta. A delicious meal in minutes!